We’d love your help. Let us know what’s wrong with this preview of In Perfect Time by Sarah Sundin. Still, as they cross the skies between Italy and souther Bold, sophisticated, and coy, Army Air Force flight nurse Lt. Kay Jobson collects hearts wherever she flies, leaving men pining in airfields all across Europe. So how can ruggedly handsome C-47 pilot Lt. Roger Cooper be all but immune to her considerable charms? In fact, he seems to do everything he can to avoid her. To ask other readers questions about In Perfect Time, please sign up. A delightful story! I loved Kay's story so much. This gal has been hurt so much in the past that she needs a whole lot, emotionally. She's played with fire by flirting with half the men she meets, and she's just about lost control of it. I especially enjoyed seeing more of Mellie and Georgie from the previous books (this series must be read in order). Christian message: strong. Evangelical. How we become a new person and how our past will no longer define who we are in the future. OHMYGOODNESS. This will take an eternity to review. But...I shall try....someday. Flight nurse Kay Jobson has always used her beauty and body to flirt with lots of men. Having fun is the only thing that interests her and she loves that nobody can resist her. Only one man seems immune to her charm, pilot Roger Cooper, who does anything he can to avoid Kay, the most dangerous woman he has ever met. Intrigued by his behaviour, Kay tries to get to know him better but her past does not want to let her go. Will she find a way to prove herself and the others that there is more behin Flight nurse Kay Jobson has always used her beauty and body to flirt with lots of men. Having fun is the only thing that interests her and she loves that nobody can resist her. Only one man seems immune to her charm, pilot Roger Cooper, who does anything he can to avoid Kay, the most dangerous woman he has ever met. Intrigued by his behaviour, Kay tries to get to know him better but her past does not want to let her go. Will she find a way to prove herself and the others that there is more behind the mask that she has worn for so many years? What a marvellous book! What a marvellous series! I never would have believed that I would love a series set during World War II so much! That was a tragic time period for many countries, many people. There was pain, tears, death... How could I have loved some books that described that kind of suffering? But then, I came across the talented Sarah Sundin and everything changed. Why? (You may wonder) Because while describing the war and its awful consequences, Ms. Sundin tells us something more. She talks about hope and love. About all those men’s and women’s hopes to live a peaceful, happy life after that absurd war. I had the pleasure of meeting lovely characters, each one of them special. And though I was sceptical about Kay Jobson at first (I was not really convinced that she could be a heroine), I have to admit that after only a few chapters I had already changed my mind about her! Her story was certainly the most intense and heart-wrenching. Her past was quite terrible, and as the story progressed I was extremely happy to see that she decided to change her habits and be more determined. I love that kind of characters. No matter how difficult a situation can be, they always find a way to be strong. And Kay definitely deserved the beautiful gifts she got after years of trouble. As for the hero, Roger Cooper... What can I say? He is my favourite of the whole series! And for the first time I understood the hero’s feelings better than the heroine’s. I knew exactly what Coop felt and why he acted like he did. I am not a pilot :P (though that job fascinates me!) and I did not experience what he did, but I could easily understand his fear of disappointing everybody. It is complicated to explain, but the fear of hurting the people I love and of not being good enough for them is something that I have in common with dear, crazy Roger! And that was the key to see what was going on in his heart. I thought that “In Perfect Time” was slightly different from the other two books in the series because, though all three are Christian books, in this one the religious aspect was stronger (after all this was Kay’s journey to find her lost faith). That is why I would recommend it to Christian readers and people that do not mind biblical references in their reads. It is not necessary to read the previous books first, but since this one is a perfect conclusion of the series and our dear nurses get their happy ending, I would suggest to read all the books in order. You will appreciate the ending more! I'll start this review off by saying that I have loved every other book I have read by Sarah Sundin, however, this book I wasn't able to finish. Once I realized that this book was about Kay, I was really looking forward to reading it! I started it, enjoyed the first couple chapter, and then. . .yeah. Kay's past didn't really bother me. I think it really gave some insight into her character, and it really helped the reader understand her on a whole new level. (view spoiler)[ I loved seeing her ac I'll start this review off by saying that I have loved every other book I have read by Sarah Sundin, however, this book I wasn't able to finish. So why did I rate it 3 stars and not finish it? At first, I really appreciated Roger. He was always encouraging, and while his past was shocking, the redemption he found through Jesus was beautiful. I loved the way he trusted God and stayed grounded in His word. But about half way through, it seemed like the focus changed. There were a couple scenes that made me very uncomfortable, and while nothing actually came of it, it just really bothered me. And then there was Roger. Suddenly his thoughts were consumed with Kay. The way he looked at her, the way he felt, it just made me even more uncomfortable. This was the main reason I did not finish the book. Now I am pretty sensitive to what I read in books, so some people may be totally fine with it. I know it just really bothered me to the point I didn't want to read anymore. Also, the plot seemed to sorta go in circles. Which really annoys me. It was almost a take-one-step-forward-two-steps-back sorta thing. It never seemed to be going anywhere. Okay, that's enough screaming. Let me just say ... this book is AMAZING. Once again, that is. The thing that really stood out in this read-through to me: drummers are so annoying. I'm sorry, but my little brother and Roger just need to find a sound-proof somewhere away from me because THEY ARE DRIVING ME CRAZY. Bay: I saw you turn around and glare at James ... what happened? Me: HE MISSED THE STUPID CYMBAL CRASH. CAN YOU BELIEVE THAT KID!?!? Originally posted in March 2017's Mini Review Day post. Where to even begin? In Perfect Time was just that, perfect. A pure delight from start to finish with abundant descriptions, an exciting setting, a powerful romance, and enough adventure to last a lifetime. Complete with a sassy, independent and courageous heroine, and the most heroic of heroes (and one of the swooniest). I knew from the moment I met him in With Every Letter (book 1) that I'd fall madly in love with Roger Cooper, but I remember being a little disappointed that Kay would be the he Where to even begin? In Perfect Time was just that, perfect. A pure delight from start to finish with abundant descriptions, an exciting setting, a powerful romance, and enough adventure to last a lifetime. Complete with a sassy, independent and courageous heroine, and the most heroic of heroes (and one of the swooniest). I knew from the moment I met him in With Every Letter (book 1) that I'd fall madly in love with Roger Cooper, but I remember being a little disappointed that Kay would be the heroine. In the first book, we are only privy to her outrageous side and we meet a woman in dire need of male attention who dresses and acts provocatively at every turn, who has no morals, and who seems to care only about having a good time with her boyfriends. Then she comes back in On Distant Shores (book 2) and we start to see what really lies underneath her bad ways and shocking actions. I, for one, was fascinated by what I saw, and suddenly I was excited to read her story and learn more about her. And she became my favourite heroine. In this novel, her soul was laid completely bare, allowing us to glimpse all the hurt and pain she'd been carrying with her from years of being mistreated and misled as a child, and suddenly she wasn't only just fascinating, but she became an object of understanding and sympathy. Once everything was explained, it was so easy to see why she acted the way she did, and it made me expectant to see how her romance would turn out all the more. Where Mellie had been the shy, demure heroine bent on helping others and loving with all she had, and Georgie the bubbly Southern belle with the charming personality, Kay is first seen as "the bad girl" who needs to be reformed, but it soon becomes evident that she's something more, something even grander. She was fierce, tenacious, a born leader, and she possessed excellent stronger qualities lacking in the two other heroines. Don't get me wrong, I absolutely loved Mellie and Georgie and they were perfect for their books, but Kay here, she was even more exciting to follow because she was so different, and grew so much along the way. Her hero was just charmingly perfect, a super good-looking C-47 pilot with a secret passion for teaching, and a strong, attaching personality that proved the perfect foil for Kay's. Although his extreme stubbornness caused many problems along the way between him and Kay, their story was the most intense and my favourite of the three. I love the bad-girl-needs-to-be-redeemed trope, with the hero who seems immune to her charms but in reality is doing his best to avoid her because of the high attraction he feels. So many sparks! So much tension! There was so much passion, so much love, so much selflessness, and so many strong bonds forged in this story, it was simply amazing. In Perfect Time was so intricate, so good, so fabulous, and just such a perfect way to end the series that now I absolutely cannot wait to pick up another book by Sarah Sundin and lose myself completely in it. Her novels are just too good. I read this one nearly two months ago and still can't be believe how awesome it was. Just wow. This is one of the best Christian fiction series I've read in a long time, please give it a try, it's worth every minute of your time, and every penny you can spare. What a great finale to this series! I have thoroughly enjoyed myself and regret putting off reading these books for so long. They are definitely not a waste of time. World War II is one of my favorite times to read about and this series "put a new spin on it" for me. I loved the characters-- thought they were well written. I was drawn into the story quite quickly and, whenever I finished one book, I couldn't wait to get my hands on the next one. With this book in particular, I really liked seeing What a great finale to this series! I have thoroughly enjoyed myself and regret putting off reading these books for so long. They are definitely not a waste of time. World War II is one of my favorite times to read about and this series "put a new spin on it" for me. I loved the characters-- thought they were well written. I was drawn into the story quite quickly and, whenever I finished one book, I couldn't wait to get my hands on the next one. With this book in particular, I really liked seeing the transformation of Kay & Roger's characters. Sure, Roger is already a Christian, but he is still struggling with some difficult stuff in his life. And Kay... well, she had a hard life growing up (and that's an understatement!) and it took someone who understood to get through to her about God. I think this may have been my favourite of the entire series, which is saying something, because I really enjoyed the first 2! I love how the author took 2 seemingly very different characters ('good boy' Roger and 'bad girl' Kay) and showed how, at their hearts, they were still struggling to overcome lies they'd been told about themselves for their entire lives. I thought both character arcs were very well done, and I loved seeing how they both learned to overcome those nagging voices in the bac I think this may have been my favourite of the entire series, which is saying something, because I really enjoyed the first 2! I love how the author took 2 seemingly very different characters ('good boy' Roger and 'bad girl' Kay) and showed how, at their hearts, they were still struggling to overcome lies they'd been told about themselves for their entire lives. I thought both character arcs were very well done, and I loved seeing how they both learned to overcome those nagging voices in the back of their heads that said they weren't good enough, and learned to rely on the mercy of the Father who loved them best. Add in the drama of the closing months of WWII, and you've got a recipe for staying up far past my bedtime because I. could. not. put. the. book. down.! REVIEW: This conclusion to the Wings of the Nightingale series was amazing. I didn't think it possible but each book was even stronger than the previous, and this series left me sad to see it end. I would love to know what happens to each of the girls as their lives continue. The transformation in Kay and Roger as they learned to be proud of themselves, who they were, and what their gifts and strengths were was inspiring. They overcame the tragedies that life had handed them. I came to hate each of their families for what they had put them through. Every child should be loved and supported by their family no matter their problems or differences. But they each saw that God could help them be what their parents though they couldn't be. Roger's sweet relationship with the children he encountered showed his true heart and soul. Kay's leadership skills developed as she depended on the strength God gave her. I loved how each of their friends supported them as they tried to change. The friendship between the "nightingales" grew and changed as each of them found their way to the Savior; and this brought them closer to one another. The storyline in this particular book was incredible. Full of love, laughter, danger, suspense and faith, it pulled the reader further and further into the plot until you felt like you were right in the midst of what was happening. Sundin's historical detail filled the storyline with richness and flavor. If you are interested in World War II history, this book again details some of the lesser known aspects such as the role of the flight evacuation nurses and the civilian partisan supporters who saved the lives of many of the allied troops during the War. I look forward to reading more from Sarah Sundin. FAVORITE QUOTES: "I think the heartbeat itself is a drum message from God. With every beat, he sends his message. His life, his love. His life, his love." "A wise man told me God gives us good things not because we're good, but because he's good." No one can write World War II tales quite like Sarah Sundin. In Perfect Time is the third book in the series Wings of the Nightingale, and we dive back into the world of flight nurses, plane crashes, and unexpected true love. Kay's story finally comes to life. Being the group beauty, she accustomed to men flocking behind her, and having a new date for each day of the week. With her looks, she seeks to control men, and get back at her father for the deep wounds he caused her. Meanwhile, Cooper is No one can write World War II tales quite like Sarah Sundin. In Perfect Time is the third book in the series Wings of the Nightingale, and we dive back into the world of flight nurses, plane crashes, and unexpected true love. Kay's story finally comes to life. Being the group beauty, she accustomed to men flocking behind her, and having a new date for each day of the week. With her looks, she seeks to control men, and get back at her father for the deep wounds he caused her. Meanwhile, Cooper is a fun-loving guy who plays practical jokes and flies planes, some of which Kay is a nurse on. But beneath his smiling exterior, he also holds deep scars, and has a mysterious aversion to women. In Perfect Time was an interesting, historically-rich tale. It was fascinating to look beneath common exteriors, and into what was going on in a seemingly “figured-out” person's life. I enjoyed the surprising twist Sarah Sundin put at the near end also. Watching everything come to a lovely conclusion for all the dear characters was wonderful! :) The faith matters were deep, and poignant, and that was very appreciated as well! The message was really good. I loved some of the analogies Cooper used when speaking of God! A down for me of the story, was the seemingly repetitive nature of Cooper and Kay's relationship. It got a little tiring after awhile, and I wished for a different tension/conflict. It ended so sweetly, that it was just about made up for. But throughout the book, it just seemed to make it drag. Also, the physical side of some relationships seemed to come too quickly... that's just my opinion with that anyway. Still a great tale though. I just love reading about World War II through this author's writings! The flight nurses are fascinating. The different army routines intriguing. Sarah Sundin definitely puts plenty of spice and intrigue into her stories. I am looking forward to reading her upcoming series! The final segment of the Wings of Nightingale series was by far the strongest and most favourite for me. Salvation and redemption through God was the key theme for me and so strong in both Kay and Roger's past. Sometimes it is so easy to accept God's salvation and know you are redeemed, but to actually understand that He has made you worthy through that process is so difficult to grasp. This was evident in both Roger and Kay's struggle to know they are good enough, their dreams have value no matt The final segment of the Wings of Nightingale series was by far the strongest and most favourite for me. I also realised again how strong of an effect words we speak can have, not just on other people but on ourselves as well. Roger's father I wanted to punch, I couldn't believe a father could speak those words over his son. And Kay's father as well - her past made you understand why she acted she way she did in book 1 and 2 in the series and how far she came by the end of book 3. I also loved how God protected her in two difficult situations with men. I enjoyed the WW2 part of this story and especially the portion when they were caught behind enemy lines. I loved the growing relationship between Roger and Kay. It is my favourite off the three. I loved to see how the friendship between the Ladies grew in the series. By the end of the book I was sad to say goodbye. What I love about Sarah Sundin's books is that she really gets me emotionally invested in her characters; that doesn't normally happen for me in a lot of modern/Christian fiction, and so I always end up really surprised by how sucked into her books that I get! She always creates such unique, real characters that I feel like I really know. I really enjoyed In Perfect Time. The characters were flawed, but so likable at the same time- I didn't think I was going to like the flirtatious Kay, but I was What I love about Sarah Sundin's books is that she really gets me emotionally invested in her characters; that doesn't normally happen for me in a lot of modern/Christian fiction, and so I always end up really surprised by how sucked into her books that I get! She always creates such unique, real characters that I feel like I really know. I really enjoyed In Perfect Time. The characters were flawed, but so likable at the same time- I didn't think I was going to like the flirtatious Kay, but I was wrong. I grew to understand her and care about her and root for her, too. Of course, sometimes the characters made choices that drove me crazy, but everything always worked itself out. And the faith message was wonderful, too. I can't count the times it had me nodding my head in agreement. I wouldn't recommend this book to younger readers, though. Both Kay and Roger have "pasts", and Kay, as aforementioned, is a flirt with a string of boyfriends (there's also a scene where a woman is nearly taken advantage of by a man). Still, though it does deal with some not-so-pretty stuff, there's more than enough hope and redemption to make up for it. In Perfect Time was the final book of the Nightingale series. I enjoyed getting to know more about WWII flight nurses through reading the series. In Perfect Time is Kay and Roger's story. I was very excited to read Kay's story because I knew there had to be some pain behind the party girl persona. I recommend In Perfect Time for those that enjoy WWII Fiction. A great ending to the series! While Kay and Roger aren't my favorite couple in the series (I think Mellie and Tom will forever hold my heart), I still enjoyed seeing their romance. This book definitely had plenty of tense action scenes and times when I held my breath hoping both characters would survive! Once thing I loved about this book and series is that it carries the characters all the way to the end of the war. The first series by Sarah Sundin I read (her Waves of Freedom series) ends mid- A great ending to the series! While Kay and Roger aren't my favorite couple in the series (I think Mellie and Tom will forever hold my heart), I still enjoyed seeing their romance. This book definitely had plenty of tense action scenes and times when I held my breath hoping both characters would survive! "In Perfect Time" provides a wonderfully satisfying conclusion to the "Wings of the Nightingale" series. Although all the characters from the prior novels make an appearance in this final installment, the focus is on the story of Kay and Roger, and their story will certainly keep you turning the pages. Female readers especially will enjoy the sparks of romance that fly between these two, as they play the age old dance of advancing and retreating in their relationship. Sundin does a great job of "In Perfect Time" provides a wonderfully satisfying conclusion to the "Wings of the Nightingale" series. Although all the characters from the prior novels make an appearance in this final installment, the focus is on the story of Kay and Roger, and their story will certainly keep you turning the pages. Female readers especially will enjoy the sparks of romance that fly between these two, as they play the age old dance of advancing and retreating in their relationship. Sundin does a great job of fleshing out her characters, delving into their pasts and present to deepen the reader's understanding of why they do the things they do. Scenes where Roger interacts with his family were especially horrifying, and I can't imagine what it would be like to be treated in such a way! I especially appreciated the great historical context this story was set in, with plenty of scenes that simply exploded with action, from exciting flying scenes to moments where I truly wondered if the characters would make it out of the situation of peril they found themselves in. The World War II setting provides the perfect backdrop to showcase what true heroism looks like, not from characters who never make mistakes (for these ones certainly do! ), but simply from those who serve to the best of their ability. Such men and women can definitely inspire our current generation, and that in and of itself makes this a book worth reading. Sundin's writing always points to God and to his amazing grace, and that shone beautifully through this book. Readers who enjoy a blend of history, high-action drama, and heart-warming romance will love "In Perfect Time" and indeed the whole series. I award this book a solid rating of 4 out of 5 stars. 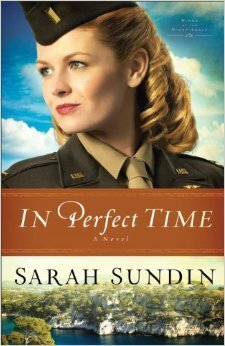 WWII is not a time period I naturally gravitate toward, except when I'm reading a Sarah Sundin book. This book is no different. The perils of war are compounded by the tension between two people on a foreign base, and not just any two people: pilot Roger who is redeemed but struggling, and Kay, whose troubled childhood has left her with scars she hides behind numerous boyfriends. Neither seems to let anyone very close, until they each get under the other's skin. Roger is determined to stay away fr WWII is not a time period I naturally gravitate toward, except when I'm reading a Sarah Sundin book. This book is no different. Roger is determined to stay away from Kay because of his disastrous record with women, while Kay is just plain confused by the fact that she can have any man she wants--except Roger. Then one moment of vulnerability, he gives her his Bible, and they start to fall in love. I left on a mission trip and accidentally left this book behind (it didn't go into the suitcase because I wanted it with me where I could easily get at it again and ended up leaving it on my desk for the week I was gone)--I was glad to get back so I could read the ending. And it's a stellar ending. Sweet, nostalgic, but with hope for the future (okay, I won't give away more than that!). Sarah Sundin is a talented author who writes masterfully about war, Air Force life, flying a plane--and true love. The third book in the Wings of the Nightingale series, In Perfect Time follows the story of Kay Jobson, a flirt and a heart breaker. She's had her fair share of boyfriends no matter where her duties as a flight nurse take her, but there's one man who doesn't fall prey to her charms-- pilot Lt. Roger Cooper. Kay is strong willed with a past that influences everything she does. Roger is focused and determined to accomplish his goals. How their story intertwines will keep you turning pages late int The third book in the Wings of the Nightingale series, In Perfect Time follows the story of Kay Jobson, a flirt and a heart breaker. She's had her fair share of boyfriends no matter where her duties as a flight nurse take her, but there's one man who doesn't fall prey to her charms-- pilot Lt. Roger Cooper. Kay is strong willed with a past that influences everything she does. Roger is focused and determined to accomplish his goals. How their story intertwines will keep you turning pages late into the night. In Perfect Time is filled with surprises and twits. It will take you on an unforgettable journey through love, danger, and transformation in ways you could never predict. I thoroughly enjoyed this last book and thought it capped off the series extremely well. The complete immersion into WWII history is excellently done and I particularly loved the musical elements (being a musician myself). This is a must read from Sarah Sundin! And make sure to check out the rest of the series if you haven't read those yet. I loved In Perfect Time so much! This book was another amazing work of writing by the talented Sarah Sundin. I don't know how she does it but every book is better than the last and In Perfect Time is definitely a new favorite. I love the way the story overlaps with the previous book, On Distant Shores , and you get to see things from the new main characters' perspectives. I also love how interesting WWII history becomes with these books. The only thing I hate is that this is the last book about I loved In Perfect Time so much! This book was another amazing work of writing by the talented Sarah Sundin. I don't know how she does it but every book is better than the last and In Perfect Time is definitely a new favorite. The only thing I hate is that this is the last book about these characters, but that's not a bad complaint now is it? If you enjoy WWII fiction with Christian aspects, I highly recommend you read the Wings of the Nightingale series. Such a great book and series! I loved it so much. Review to come. I had heard about Sarah Sundin's books, and always wanted to one day read them. So when I was able to review the third book in her current series Wings of the Nightingale, I was very excited! I enjoyed reading In Perfect Time a lot, and loved the story! This book is definitely one of those that heavily focuses the plot around the two characters, so occasionally I felt it could have had more sub-plots and further developed other characters in the story; or perhaps expand on the historical details I had heard about Sarah Sundin's books, and always wanted to one day read them. So when I was able to review the third book in her current series Wings of the Nightingale, I was very excited! I enjoyed reading In Perfect Time a lot, and loved the story! This book is definitely one of those that heavily focuses the plot around the two characters, so occasionally I felt it could have had more sub-plots and further developed other characters in the story; or perhaps expand on the historical details of the time period. I felt like even though the story is a historical fiction, I would have liked to have seen more historical bits, as it felt solely focused on the story versus the time period. However the plot was very exciting and steady, since both main characters are involved with doing their part for the war effort, whether it be shown through their jobs as pilot and nurse during the Second World War. The romance between Kay and Roger was very unique and original. I really loved how the story started with Roger helping lead Kay into a true relationship with the Lord when he have her his Bible. I loved seeing both character's faith in the Lord strengthen and grow throughout the story. Their friendship was very unique and I loved how the author wrote their love story. Right from the moment that Roger gave Kay his Bible, I really admired his character, and found that my admiration for him only grew. He was such a neat character, and one that I really enjoyed getting to know in the story. I also really enjoyed seeing Kay's development throughout the story. She became a new person after becoming a Christian, and I loved seeing that transformation take place on the page. I also enjoyed seeing her journey to redemption and how she dealt with things that were in her past that tainted her view of the Lord, and how she worked to overcome the lies she grew up hearing, believing the truth instead. Even though I occasionally felt like the novel was a bit slow for me, I don't think it was due to the story not having interesting scenes, as the plot was very constant. A lot of different things happen that keep you reading, however I felt like sometimes I wasn't as eager to continue reading. Overall it wasn't a huge deal, but still something I noticed. In all, I really enjoyed this endearing love story of two people, sharing about their relationship with each other and the Lord. While it felt a bit slow to me at times since I felt it lacked interesting historical detail and further plot and character development aside from the main characters, I loved the plot and especially the unique ending! I would recommend this book to fans of historical romance. In Perfect Time is the third and final book in the Wings of the Nightingale series. What an incredible read it is! This series follows a group of female flight nurses in World War II. I love how each book builds on the last. (You don't have to read them in order, but I would definitely recommend that you do!) By the time I got to the end of this book, I felt like the characters were friends, and I was so sad to turn the last page. There are three things that really have hooked me on Sarah Sundin In Perfect Time is the third and final book in the Wings of the Nightingale series. What an incredible read it is! This series follows a group of female flight nurses in World War II. I love how each book builds on the last. (You don't have to read them in order, but I would definitely recommend that you do!) By the time I got to the end of this book, I felt like the characters were friends, and I was so sad to turn the last page. There are three things that really have hooked me on Sarah Sundin's books. First, she gives readers characters that are interesting, realistic, and emotional. Even though her stories are set during WWII, I feel like I can relate to the people. Second, she makes history come to life. For whatever reason, there aren't a ton of books set during WWII. It's a fascinating period in history, and I love reading about it. Sundin brings interesting and sometimes obscure facts and features them in her books. I've totally enjoyed reading about female flight nurses during this series! Plus, I felt like I was in the midst of the action throughout this book in particular. Finally (and most importantly to me), faith is always a central theme throughout her books. She definitely doesn't do "cheesy" but God is a primary focus of the characters. I appreciate how she handles this and weaves it throughout fairly effortlessly. It was also fun to see In the final installment of a Wings of the Nightingale series, readers get to experience Kay’s story as Sarah Sundin once again takes readers back into the European theater of World War II. It was also fun to see characters from the other books in the series play important parts in this novel. They don’t take away from Kay and Roger’s story by any means, but having them play significant parts definitely enhances the storyline. If you haven’t read the previous ones, you can still enjoy this one (I actually have the first one waiting for me on kindle) on it’s own, but knowing some of the back story did make it fun to read. I will say that while it was a bit predictable, it still had its charm (i.e. morse code) and it was a sweet and redemptive tale. Some characters were a wee bit stubborn. At one point I wanted to pull an Elsa on Roger and start singing "Let it go!! Let it goooo!" but I don't think that would have helped ;). Sundin also has a talent for creating wonderful, charming and lovable children you wish you could hug. If you enjoyed the previous two novels, then you'll enjoy the conclusion to the Nightingale Series! Have you had a chance to read any of Sundin's novels? What is one of your favorites? Also, be sure to join in the fun giveaway and author chat! If you have followed the Nightingale series at all, you have gotten the chance to really get to know these three nurses fighting to save our boys in WWII. While you don’t need to read them in order to enjoy each novel, I believe you’ll have a stronger appreciation for the depth of characterization-especially for our heroine, Kay. Kay is the quintessential nurse with a string of boys at every base. To uncover the deep-seated desires she has buried away in her heart and the hurt from her past made If you have followed the Nightingale series at all, you have gotten the chance to really get to know these three nurses fighting to save our boys in WWII. While you don’t need to read them in order to enjoy each novel, I believe you’ll have a stronger appreciation for the depth of characterization-especially for our heroine, Kay. Kay is the quintessential nurse with a string of boys at every base. To uncover the deep-seated desires she has buried away in her heart and the hurt from her past made my heart hurt for her. Roger is one of those heroes that has this, almost a persona, of being a great and godly guy-and he is, but he certainly dealt with his own sense of struggles from his past clouding his worldview. There is a certain theme to the book that makes the reader realize that the influence from our past, be it good or bad, has a strong influence on our present and often in the choices we make. How are we influencing those significant people in our lives? The romance is rocky and difficult against the backdrop of the WWII landscape. But I, as always, appreciate the history layered so well with the characterization and romance of the characters and their lives. Great to see returning characters from previous books and get to know our current hero and heroine all the better. Thumbs up reading! This review is my honest opinion. Thanks to Litfuse for my copy to review. Going to pick this up from the library. Can't wait to read! This book is definitely my favorite this year. I don't give five stars often. This is at least five stars. Excellent! I won't retell the story. It is the third and final in the Nightingale series, which is about the flight nurses in World War II. Balance is the key in my opinion. Sarah exhibits a tremendous ability to balance the details of history, the story line, and the characters in her books. The reason her books stand so well is tha Going to pick this up from the library. Can't wait to read! Balance is the key in my opinion. Sarah exhibits a tremendous ability to balance the details of history, the story line, and the characters in her books. The reason her books stand so well is that the author's theology of the God of the Bible is so naturally woven into the very fabric of her story and characters, not artificially inserted, that it holds everything together. I love the way the author uses two points of view seamlessly, and infuses the facts of the historical aspects of the story also seamlessly. Her style is, I don't know another word to describe it, seamlessly smooth. I love both Kay and Roger, and their character development in the story (which I won't spoil). I love the author's repetition to show character. I was deeply moved both by their characters and the historical events, knowing that many of these wartime events are historical. I was most deeply moved by the characters' growth in their relationship to God. An intense chain of events fill this book with nonstop action, danger and wartime uncertainty. Characters are diverse and convincing, and the interaction between them is unpredictable. Army Air Force staff are clearly described, and the events throughout have been well researched and documented. "In Perfect Time" is not only fascinating and electrifying, but educational as well. Ghosts of the past play an active role in the lives and actions of the main characters, and caution prevents their rel An intense chain of events fill this book with nonstop action, danger and wartime uncertainty. Characters are diverse and convincing, and the interaction between them is unpredictable. Army Air Force staff are clearly described, and the events throughout have been well researched and documented. "In Perfect Time" is not only fascinating and electrifying, but educational as well. Ghosts of the past play an active role in the lives and actions of the main characters, and caution prevents their relationship from developing into a serious romantic involvement. Sarah Sundin has done an incredible job of researching her subject matter, and presents exciting, unforeseeable circumstances that kept my attention throughout this book. Relationships between characters are believable, and truth plays a very important role in the growth of Lt. Kay Jobson's faith. I thoroughly enjoyed this fast paced book of wartime action and relationships, and highly recommend "In Perfect Time." I had not read the prequels in this series, but this book can stand on its own. Excellent historic fiction! My least favorite of the series. I loved some of the faith aspects of the book, and Sundin did a great job with the characters. Yet, I didn't enjoy the story as much. Maybe I didn't connect with the characters like I did in the other books. Words cannot describe how much I loved this book. I'm not even kidding. I tried writing a decent review but I can't because every single thing about this book is so amazing.